The ACC Value Index - We're Not Worthy! The Association of Corporate Counsel held its annual meeting recently in chilly Boston, and the next phase of the ACC Value Challenge was released: make way for the ACC Value Index, a "client satisfaction measurement tool that helps ACC members share meaningful information about the value they get from their outside counsel." I applaud the continuing effort to not just admonish law firms for not fully meeting client needs, but for providing practical tools and techniques to guide law firms in their efforts to deliver more value. We could go on for days discussing the need for yet another law firm rating system, and the pros and cons of closed vs. open systems, the merit of subjective vs. objective rating criteria, which criteria really matter, and so on. In fact, that debate is already underway (here and here) and will likely continue -- in part because debating lawyer ratings is as prolific and inevitable as the ratings systems themselves! ACC would probably be even more effective were it to, shall we say, align more with others singing the same tune in order to amplify the efforts. But this isn't a critique of ACC; they should be commended for helping to put a voice and a framework around issues many have been discussing for years. What exactly is the value index? Essentially, it's a scoring system that measures a law firm's efforts in six specific categories, plus an opportunity for unfiltered commentary, and ultimately the question at the heart of a client's level of satisfaction: Would you use this firm again? For the six primary questions, the rating scales from 1 to 5, with 5 representing excellent. Others may raise the oft-repeated criticisms that 5-point scales tend to regress to the mean, and that ratings systems often reflect selection bias because dissatisfied customers make their view known in greater numbers than satisfied customers. I'll merely say that simple is better if one seeks rapid adoption, and ACC's approach appears to meet that challenge. What are the six rated categories? Understands Objectives/Expectations - I don't know whether ACC has listed these categories in order of priority, but if so then this is an apt place to start. So many engagements falter, and costs exceed expectations, because the outside counsel and in-house counsel don't have the same understanding of the desired outcome and the path to get there. In business, surprise can be a fatal mistake, so setting proper expectations is critical. In-house counsel share responsibility in not just explaining the issue, but if they have ideas on the optimal process to achieve the desired outcome they had best reveal it. This doesn't mean the law firm must adhere to the approach -- after all the in-house counsel is often paying for the outcome -- but this should generate a dialogue regarding what's expected, and what level of risk the client is willing to take. Legal Expertise - Many lawyers believe this is the primary asset the client is buying. But in many cases, it's really just the table stakes to get in the game. The firm wouldn't even be considered for the work if there wasn't already a belief that their legal chops are superior. So it's not enough to do the work, but demonstrating innovation and an in-depth understanding of the relevant guiding authorities, based on prior experience, is critical. This isn't done by producing a deal list, substituting quantity for quality, but by regularly discussing strategy with the client, identifying alternatives, and calculating the costs of different approaches, including doing nothing. Responsiveness/Communication - Many lawyers read this as speedy response times and 24/7 accessibility. Of course there are clients who define responsiveness in this manner, but as often, probably more often, the better definition would be keeping me apprised of progress so there are no surprises, and so I can develop contingency plans when the unexpected occurs. This also means providing clear updates rather than confusing obfuscation. Relying on the all-too-often inscrutable notes entered by each lawyer at time entry to inform the client of the project's status is insufficient. Reduce the noise to a simple dashboard report, reflecting progress on key deliverables and highlighting questions and potential challenges. Predictable Cost/Budgeting Skills - Hand in hand with project management skills are budgeting skills. Imagine in our construction scenario above that two general contractors are competing to win the project. One relies on long experience to provide forecasts and budgets within certain ranges and expectations, while the other claims similar experience but suggests that complex construction projects are too variable to pin down a forecast or adhere to a budget. Who wins the work? It's that simple. Law firms that develop some rigor in providing forecasts and budgets will have a competitive advantage over the firms clinging to the "it's too uncertain to know" school, and they will have a greater opportunity to employ profitable alternative fee arrangements. Sound financial management isn't the same as trying to win new work by lowering rates. 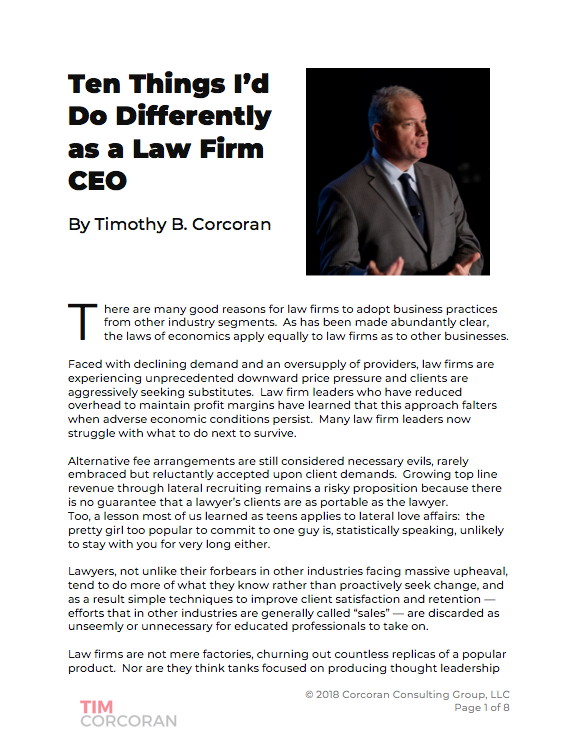 As many law firms have learned, at times the client is as concerned about predictability as total cost, so those firms that reduce rates when what's really needed is more predictability are leaving revenue on the table. Results Delivered/Execution - Many lawyers read this as achieving a certain outcome, such as winning in litigation or closing the deal. Business people often define the outcomes differently, based on their tolerance for risk and their business objectives. Is the goal to launch the new product in a timely manner and generate new revenue streams, or is it better to delay the launch until every potential avenue for loss of IP protection can be identified and addressed? Is the goal to win the suit, or to balance litigation and public relations costs with winning? It's critical that law firms know explicitly what outcome is desired, and orient their actions to that outcome. Sometimes the best choice is to do nothing. Sometimes business people knowingly choose paths that expose them to legal risk, but they accept risk in every decision. The role of the lawyer is to inform these decisions, to help quantify the costs to the business of the various viable approaches. There are some understandable concerns with the ACC Value Index. For example, at present, law firms do not have the opportunity to view any client feedback, though that ability will come in due course -- else the exercise would be somewhat ineffective in changing the behavior of those law firms rated poorly. The anonymity of the program may lead some law firms to dismiss negative feedback. And there will be some uncertainty as to what constitutes excellent rather than mediocre performance. The age old questions "What are we doing well?" and "What can we improve?" have found a new locale but the fundamentals remain the same. It's now more important than ever before to implement a structured and permanent client feedback program that starts by asking the questions relevant to the ACC Value Index, but delves more deeply into areas of particular strategic importance to the firm. Only by knowing how clients feel can we improve. And the best way to learn is to ask, something too few firms do according to numerous studies. If simply asking can be a differentiator, just imagine the loyalty a law firm can engender by actually acting upon client feedback! So why wait? For additional insights into the Value Index, see this post by Fred Krebs, ACC President.